Earlier this year, the London Zoo made a worldwide appeal to find a mate for two of its most eligible bachelors -- a pair of Mangarahara cichlids, among the last three known members of fish species racing towards extinction lest a female be found. After failing to turn up any lady cichlids in zoos, aquariums, or private fish collections around the globe, the Zoological Society of London decided to take a more hands-on approach in their desperate bid as matchmaker. 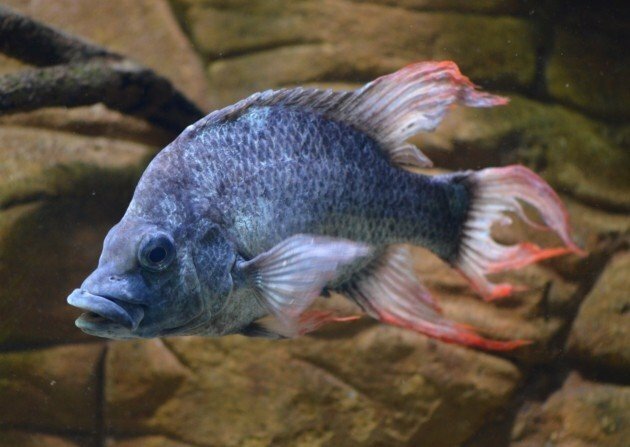 A villager in the cichlid's native Madagascar had contacted the Zoo saying he had seen the fish, thought to have been wiped out entirely in the wild. Armed with that tip alone, the ZSL mounted a search expedition there on the off chance the claim was true. According to the London Zoo, days of searching in the remote Madagascan village's stream initially proved fruitless -- that is, until they happened upon a tributary that had become disconnected from the main waterway. Incredibly, the team found a small population of Mangarahara cichlids still clinging to life there, including a few highly sought-after females. "We weren't holding out much hope of finding any fish in the wild, as so much of the Mangarahara River now resembles the desert because of deforestation and intensive agricultural use," says London Zoo curator Brian Zimmerman. "These cichlids have shown remarkable survival skills, and managed to find one of the very last remaining water sources to live in, but their numbers are tiny and the non-flowing water is not an ideal habitat for them. We're now doing all we can to protect these remaining fish." Zimmerman and his team collected 18 of the surviving fish, and plans are currently underway to begin breeding them in captivity -- offering new hope to a species that seemed destined to be lost to the ages.